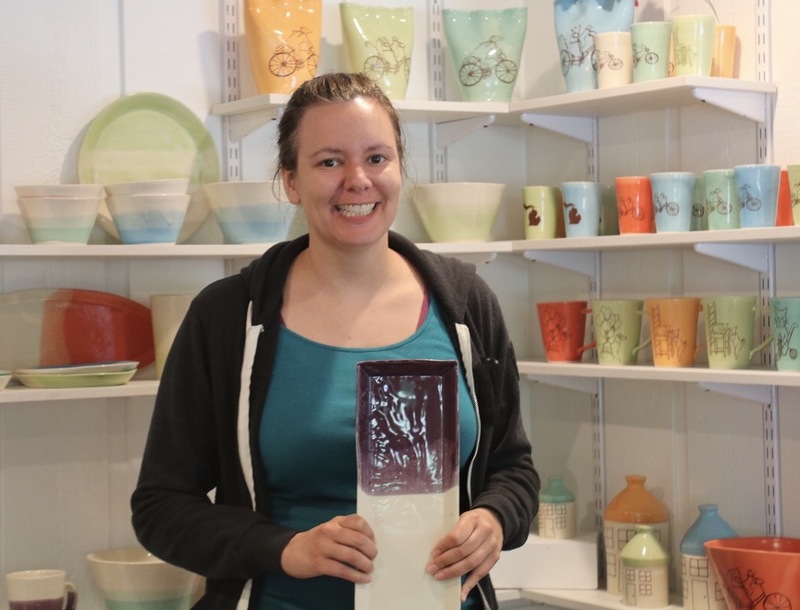 In an former veterinary clinic-turned-clay studio just outside of Plainwell, Michigan, Heidi Fahrenbacher creates a whimsical Bella Joy Pottery line. To produce her unique collection that includes functional mugs, tumblers, vases and hanging planters, Fahrenbacher created her original designs on a potters wheel. She then fabricated the plaster molds she uses to recreate her originals using liquid porcelain. Each piece is finished and glazed by hand in bright color palette. 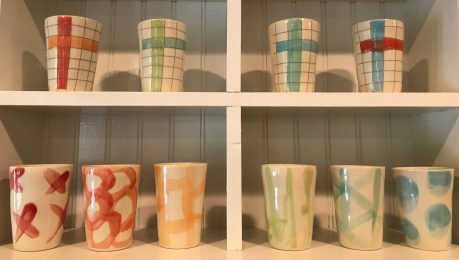 When you look at Heidi Fahrenbacher’s pottery, you see rainbow colors and some times unicorns (Her unicorn mug with gold polka dots is a popular new addition to her product line.) But what customers don’t see are the challenges she had to overcome to make a life for herself as a successful professional artist. From personal loss to physical setbacks, changing her major and moving her studio out of a chicken coop on her parent’s property to a building of her own, tune in to this episode to hear talk about her creative journey and what she learned along the way. Shop Bella Joy online here and check out her work in person Wednesday – Friday from 1-4 p.m. (or by appointment) at 11933 Doster Road, Plainwell, Michigan 49080. The idea to make this mugs using liquid porcelain seems to very creative, it’s been rare that using this method. Have you ever considered about including a little bit more than just your articles? I mean, what you say is important and all. Nevertheless think of if you added some great graphics or videos to give your posts more, “pop”! Your content is excellent but with images and clips, this site could definitely be one of the best in its field. Amazing blog! Hi! I’ve been reading your website for a long time now and finally got the courage to go ahead and give you a shout out from Lubbock Tx! Just wanted to say keep up the good work! First off I would like to say fantastic blog! I had a quick question which I’d like to ask if you don’t mind. I was curious to find out how you center yourself and clear your thoughts prior to writing. I’ve had a difficult time clearing my mind in getting my thoughts out there. I truly do enjoy writing however it just seems like the first 10 to 15 minutes tend to be lost simply just trying to figure out how to begin. Any recommendations or tips? Thanks! I was extremely pleased to locate this web page. I wanted to thanks for your time for this great read!! I absolutely enjoying just about every small bit of it and I’ve you bookmarked to have a look at new stuff you blog post.